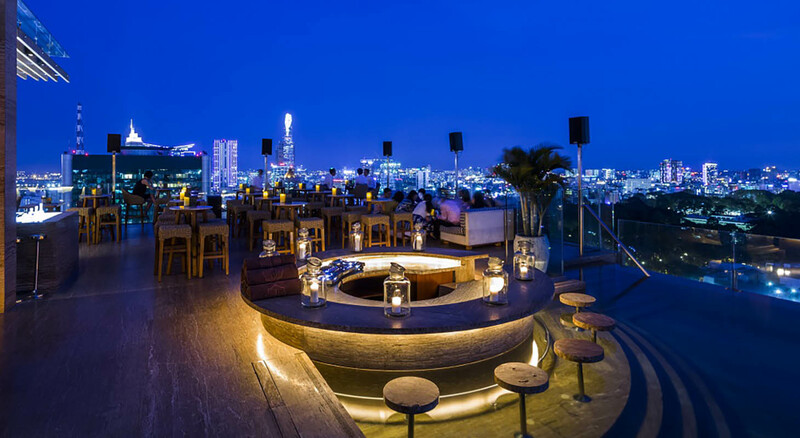 Rooftop bars are such a staple of Saigonese nightlife now, so much that each skybar seems to have its own distinguishing feature and style. Patrons come for the view, pay extra for drinks, and partake in the thriving scene of a city coming alive at night. 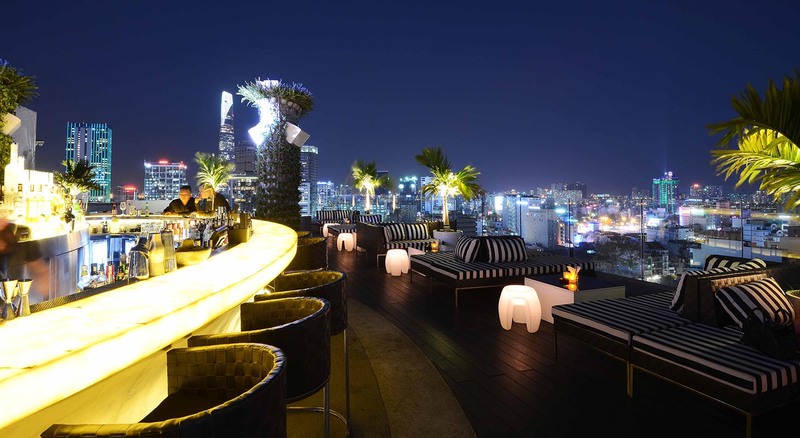 While it doesn’t have the scope of Hong Kong or New York, Ho Chi Minh City’s skyline is compelling and its rooftop bars are open year round. Sunsets, cocktails at dusk, streets lit up by motorbike traffic, construction cranes in the distance, are all part of the skybar experience in this city. 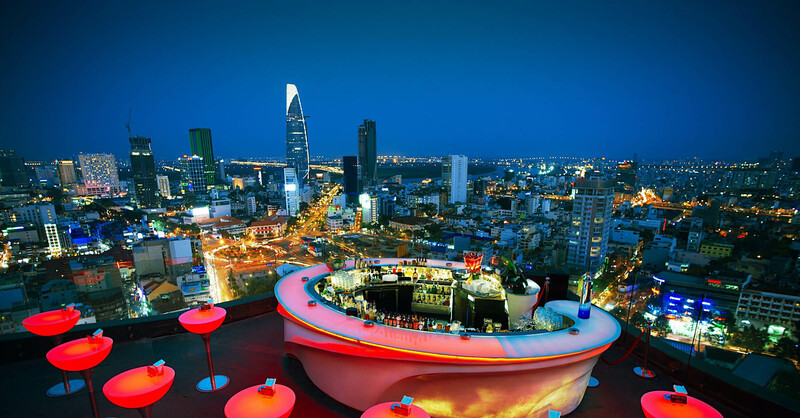 Below are the rooftop bars that offer the best vantage points and experiences for seeing Ho Chi Minh City from above. Anan Saigon opened in April 2017 to much fanfare, headlined by celebrity chef Peter Cuong Franklin who famously led the opening of popular eatery Chom Chom in Hong Kong. 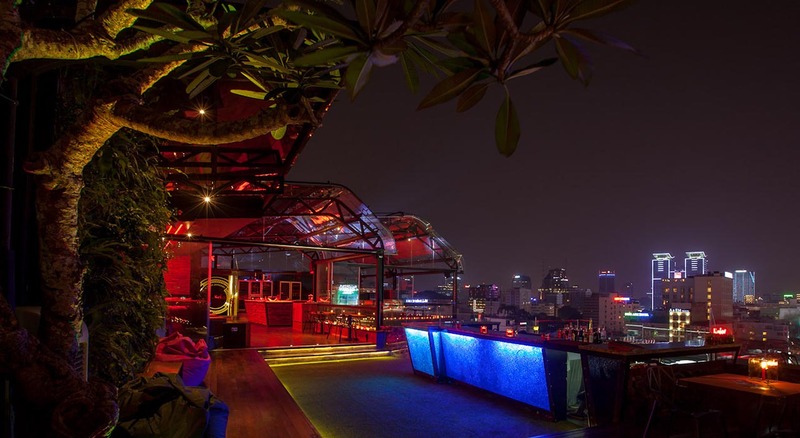 A departure from the typical Saigon rooftop, which usually features loud music and standing tables, Anan Saigon’s rooftop is hidden in the Old Market of District 1, right next door to Bitexco Tower. Featuring breathtaking views of the Bitexco Tower, Times Square, and the Old Market, the sunset view from Anan is not one to be missed. Featuring a fun lineup of cocktails like the gin and lemongrass Hanoi ’75, the Tra Da gin-infused black tea cocktail, Anan is also well known for their Bia Hoi happy hour (yes, you read that right). Not to mention the food menu that knocks it out of the park, and is unrivaled compared to the other rooftop bars in the city. Broma is a bar, despite the name. But it’s also a restaurant priding itself with chill vibes and a cosy atmosphere. Broma has a diverse selection of cocktails and both international and local craft beers. Located on the 4th floor of a French-style building, it is not one of the highest spots in the city, but has a great view nonetheless. In the evening, surrounding buildings’ lights help illuminate to Broma’s quaint atmosphere, in addition to their own twinkling lights hanging above. This is a good place if you’re trying to immerse yourself in a little bit of Western culture as their cuisine strays away from typical Vietnamese dishes and their live music performances orient more to their regular non-local customers. On any given weekday you’ll come across live music at Broma and a pretty view of Nguyen Hue walking street, crowded with pedestrians. There’s nothing quite like enjoying drinks and watching selfie snapping pedestrians below. Broma’s drinks are adequate, nothing to be excited about, but the venue and ambience are reasons for coming here. It’s a relaxed atmosphere, with a large cushiony lounge area. A good place to chat and enjoy live music. 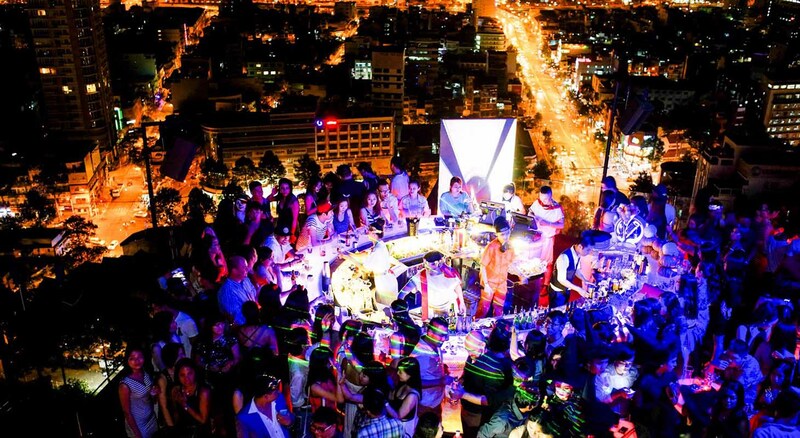 Airbar 360 opened up a couple of years ago marketing the wave of the next generation of rooftop bars. For some reason, these newcomers always seem to include a rooftop pool that no one uses. Positioned and dimly lit for atmosphere. Airbar 360 is horribly named. It always makes me think of a Nike sneaker endorsed by Michael Jordan rather than a classy place to go. I suppose its name is advertising the truly all encompassing view. 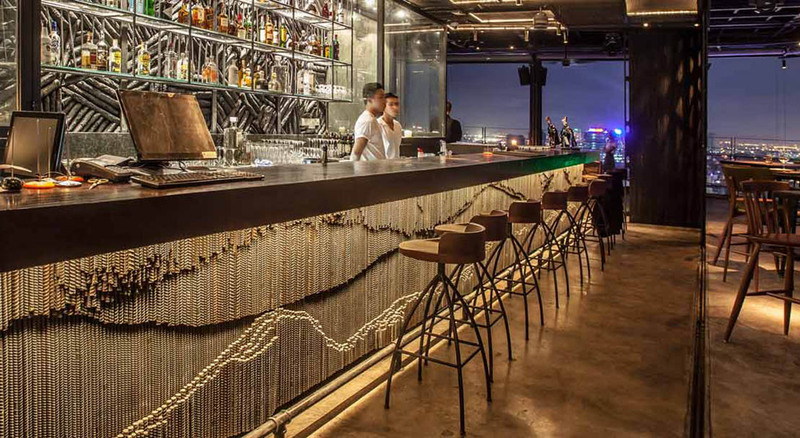 With its generous seating, sofas to high tables, Airbar 360 is a well designed bar and space. There are pavilions on the lower floor next to the pool to relax in small groups or with your significant other. Music here leans toward cool background tunes in the early evenings, though at night it becomes another club, like Chill, complete with a DJ and loud tunes, albeit a slightly lax dress code in comparison. One early evening I came here for happy hour in flip flops. The staff kindly gave me shoes to wear, free of charge, in order to match its mild dress code that most rooftop bars have now. Kudos for their gesture of helpfulness. The design of this bar is intentional with its name. The central bar is an oval pod, with its counter gently lit up to convey that “glow”. A brightly lit sign is placed at the bar’s entrance, drawing photographs and selfie-taking customers. A similarly glamorous staircase leading to the bar from the elevator makes for a similarly photogenic entrance. All this glowing gives a wonderful effect on most nights. But it is also a beacon for bugs on humid, warm ones. I recall swatting about five mosquitoes and gathering all the moths on my table counter one summer night here. Overall, it’s a wonderful bar, especially on relaxed weekday nights, where you can take a date and enjoy the view from one of its cushiony sofas. Glow plays quieter music and lets you have conversations. It also, smartly, has a club just below called Play, for those wanting a louder, more raucous scene. The best of both worlds are on offer. OMG has also been on the scene for a while. It has one of the more captivating views of the skyline. Located next to Cho Ben Thanh, it’s only on the 8th floor, and thus gives a more eye level view, rather than birds eye view scope of the city. Its raised up verandah also juts into the street and turns it into a floating peninsula surrounded by the buzzing glow of traffic below and high rises around. These two rooftop locales have a connected glass bridge you can walk in between. They are also prime spots to spend your relaxed hours at dusk, watching the sun descend. Both are beautiful places to bring a date to. The Social Place, built on top of the MGallery Hotel Des Arts Saigon, has the better interior design and view, with an infinity pool that perfectly cradles the colors of the sunset. Unfortunately, you can only swim in it if you’re a hotel guest. Next to MGallery is Shri, which has the better happy hour deal and drink list. It also has more options for food and a different view of the city. In either case, if you’re bored with one view, take your date to the other location and romantically ponder the possibilities of the city. The first ritzy rooftop bar and club on the scene, Chill set the bar high with its prime location and ideal height for city watching. It’s on the 26th floor of the New World hotel. “Chill” is also a total misnomer. It’s a place to come and party, be seen, glam it up with others. Not to chill. The moderately successful come here for good drinks and for the environment. The wildly rich come here to buy bottles and impress. It’s a place to look good and mingle with other well dressed cosmopolites. There’re plenty of tall lit up pods geared for dancing and mingling. Not so many couches or cushions to sit down or relax. At night and on weekends, DJs are on scene pumping EDM to a hopping crowd. It’s a formula that Chill started and it works fantastically well. 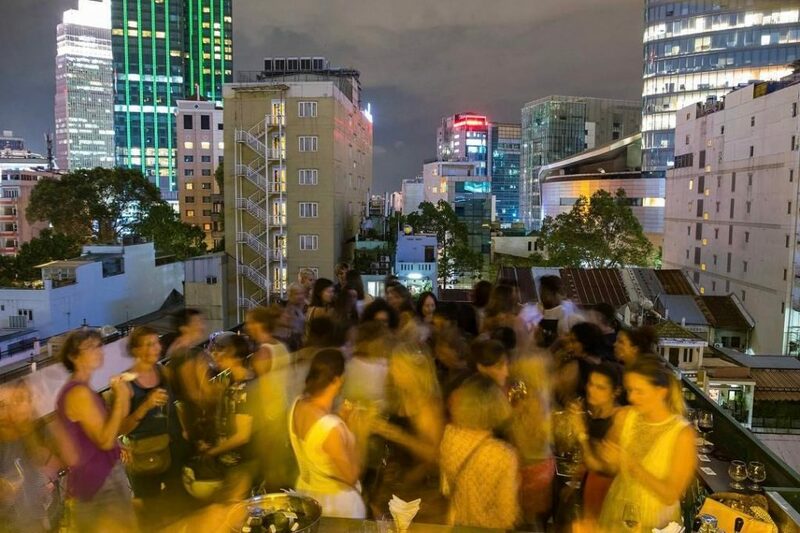 Vietnam’s young, trendy crowd love to dance outdoors at a club with a view. And what a view: ritzy nearly 360 degrees perspective of the area all around the central business district. All the buzzing humanity below can be seen. The cocktails at Chill are also quite good, made by capable bartenders. They’ll cost you though, as this might be the priciest of the skybars we’ve been to. So which one do we recommend? There are numerous other rooftop bars that didn’t make the list, including a list of old guards of bars set atop famed hotels, the Rex, the Caravelle, the Sheraton, etc… Each is worth seeing if you’ve some time, after you’re done with this list. Regardless of where you are in the city, though, get above the buzzing fray, take a moment to enjoy the vistas offered in this lovely city. You’ll be glad you did.